We've got "mail" in our name, but we can do a whole lot more than that. Mailchimp is a multichannel marketing platform that can help you reach new audiences and strengthen relationships with existing customers. Use Mailchimp's free e-commerce features to sell more stuff and track earnings for your business without ever leaving your account. In this article, you'll learn the basics of Mailchimp and e-commerce, and get some ideas for growing your business. First things first, you'll connect your online store to Mailchimp. 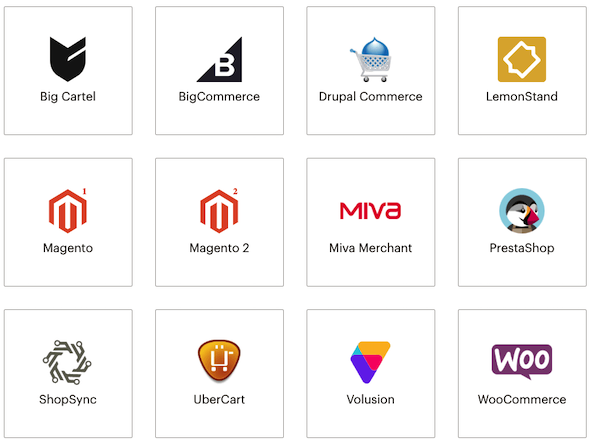 We integrate with many popular platforms like Magento, BigCommerce, WooCommerce, PrestaShop, and more. To view all of our supported e-commerce stores, visit the Connected Sites page. After you connect, you'll have lots of powerful e-commerce tools at your fingertips. Get the most out of email with the power of data. Boost sales results for your regular email campaigns with customer segments, product recommendations, and promo codes. Here are a few strategies to try. Segment your recipient list based on purchase activity or predicted audience demographics. Then build an email or automation tailored to your segment with enticing offers or coupons. Drag and drop data-based recommendations from your online store into your emails. We'll make sure the right recommendations show up for each customer who receives your email. Consumers tend to search for the best bargain before they buy, so why not win them them over with a discount? To incentivize your customers to make a purchase, use a promo block to include your code in a campaign. Automation can be a big time-saver and revenue booster. Try Mailchimp's free automated emails, including welcome messages, abandoned cart notifications, and order receipts. With the right automation, you can generate up to 16 times more orders at your store. Customers are busy, and industry research shows that most people who add an item to an online shopping cart will abandon it. Time to reclaim some of that money! Mailchimp can help you create a beautiful automated email that sends to customers who've abandoned their shopping cart on your site. Want to make sure your website visitors get a nice, warm welcome? Send them a welcome automation. Educate newcomers on your products or services, or send them enticing coupons to convert them to paid customers. Yep, Mailchimp does ads too! Take the leap and go beyond email with social or retargeting ads, which are available on all Mailchimp accounts - even free ones. Anyone with a Mailchimp account can use our Ad Builder to create beautiful web ads for Facebook and Instagram, or Google web retargeting. You'll still have to pay for the ad budget, starting at just a few dollars per day, but Mailchimp doesn't charge any extra fees. We've made it easy to design and run a social media ad on the web. Use ads to boost product sales at your store, or find new leads. Social ads can help you cast a wider net and reach new people who might enjoy what you're selling. Try our similar audiences tool to display your ad to people who share similar interests, purchase behavior, and traits with your existing email list. Mailchimp's Google remarketing ads can help you recapture the interest of people who visited your website. These ads follow your visitors around the internet to remind them of all the cool stuff they saw on your site. After you've started adding product recommendations, building ads, or sending automations, you can sit back, relax, and watch your results come in. Here are the helpful stats you can view in your account. You'll see the account dashboard each time you log in to Mailchimp. Use it to track revenue, audience engagement, and list growth. You can even see how much money you've earned from Mailchimp features. List statistics and campaign reports will help you gauge how much stuff you're selling with Mailchimp. Easy-to-read graphs and charts show opens, clicks, audience growth, and revenue. Mailchimp's e-commerce features are available for everyone—Monthly, Pay As You Go, or Forever Free accounts—and most of them are free. Ads are available for purchase, for both free and paid accounts. For an in-depth look at each e-commerce tool we offer, check out our article: How Mailchimp can Help Your Online Store. Or, if you're ready to try these tools and features now, connect your store to Mailchimp to get started. Mailchimp’s e-commerce tools help you grow your business and sell more stuff. Find new audiences, promote your products, boost customer loyalty, and track your sales.